Blackjack is a game of cards and cards are assigned various values to facilitate the counting methods used in playing blackjack. An ace is assigned two possible values 1 and 11 and the choice of which one to use depends on how the value affects the total which must never exceed 21. The other numbers 2 to 10 take the numerical value on the cards' surfaces. Kings, Queens and Jacks are assigned the value of 10 each. A blackjack or a 'natural' is said to occur when a player or dealer obtains an ace with another card whose face value equals ten. A blackjack can only occur with the first two cards dealt while additional cards that may bring the same value are simply called 21. A blackjack is paid in the ratio of 3 to 2. Blackjack rules vary according to casinos and there are many variations of the game itself; there is even special blackjack chart which help you to choose the right step of the game. But the basic rule of playing towards acquiring 21 remains and the fact that you will be dealt two cards initially. Many variations require the dealer to only have one card face up which you can take advantage of vary your play. The dealer plays his hands when all the players have done their bit. Whether you ask for more cards and how you play is determined by the type of cards you are dealt initially. The player ideally requires a blackjack or 21. A blackjack is obtained if a player is dealt an ace and a card with a value of ten in the first two cards. A dealer may also be fortunate to get the blackjack in the first two cards. A player who does not get a blackjack continues hitting until he gets a hand of 21 if that is possible. Going beyond 21 is a bust and the player looses automatically without the dealer raising a hand. A player has the option of standing when the hand totals make it very tricky hitting another card. Such scenarios occur when a player has a total of 14 and above meaning that there is great possibility of heating a figure hire than seven which will result in a bust and a loss. A player may therefore declare stand to let the dealer player. Declaring a stand on the side of the player also depends on the dealer's up card. If the dealer's up card is not an ace or a jack then it means the dealer does not have a blackjack. The value of the dealer's up card can also tell whether it is possible for the dealer to have a hand higher than the player. 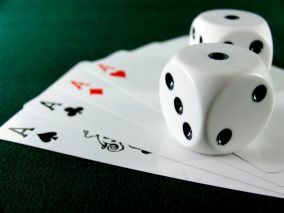 A dealer needs to hit a hand of 17 and can stay in between 17 and 21 depending on the player's hand. If there is no busting then the one whose hand is greater wins. Charlie rule is used in some casinos and it means that if a player manages to hit say five cards without busting then he wins.